I’m scrapping my previous book review formula, The Quarterly Book Report. It made for posts that were too long (I felt), and forced me to condense my thoughts on a book down too far. From here on out, I’ll just drop a review randomly as I finish a book, capiche? I finished this book a month or so ago, but since I just decided to scrap the old format I’m reviewing it now. 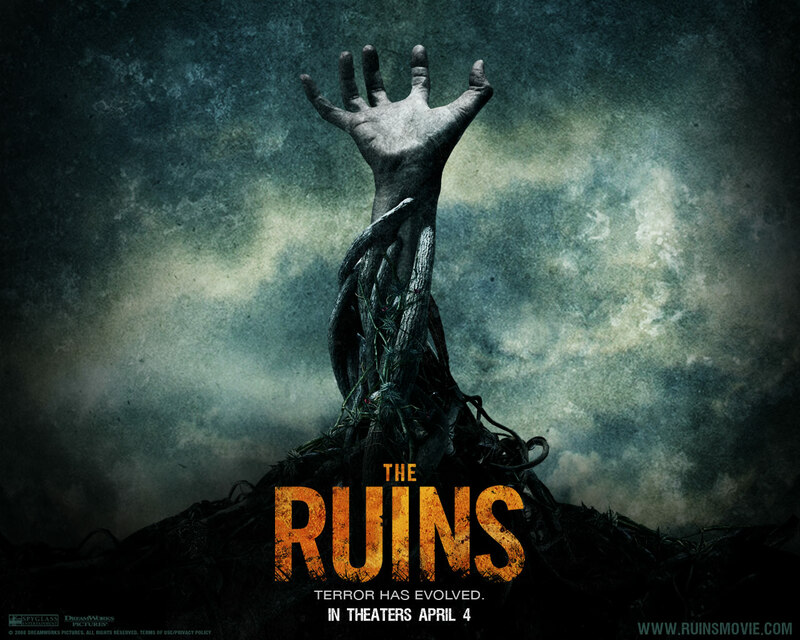 I watched the movie version of The Ruins a few years ago on cable, and liked it well enough. I remember it being a little cheesy, but in a cool , B-movie kind of way. Ultimately I thought it was ‘just okay.’ Then a couple of years ago when I started really getting into reading again, I wanted to see what had been going on with books in the horror genre, and I found list after list of Best Horror Novels of X amount of years, and The Ruins kept popping up on the lists with the same comment: “The book is so much better than the movie.” Everybody says that about books made into movies, so I didn’t think a whole lot about it until one day, about two months ago, I found The Ruins along with Sharp Objects by Gillian Flynn at my local used bookstore—quite the score indeed. The Ruins tells the story of six tourists on a Mexican vacation—four Americans, a German, and a Greek—who embark on an adventure to find the German’s brother, who’s run off with a woman he met and gone to the site of a supposed archeological dig. Following a crude, hand-drawn map, the group takes a bus ride, hitches a ride in the back of a truck (with a vicious dog in tow), and hikes extensively into and back out of a small village before finding a hidden trail. The trail leads them to an massive hill overgrown with vines with little red flowers. Villagers show up and try to scare the tourists away, but language barriers inevitably lead to mass confusion, and when one of the tourists makes contact with the vines the villagers then force the tourists (at gun and arrow point) to hike the narrow trail leading up the hill. At the top the tourists find a couple of abandoned tents battered by the elements and a few supplies left by whoever was there last. The first half of the novel reminded me of a straight-forward survival story. This group of people, stranded with practically no supplies except what they happened to grab before leaving their luxurious hotel—water, a couple of protein bars, some fruit, and a bottle of tequila—and the empty tents and supplies, struggle to survive and find a way off the hill, which remains patrolled by the villagers. Confident help will arrive in the form of the Greek’s friends (for whom he left a copy of the map), the group tries to make do. At the bottom of a mineshaft the group hears what appears to be a cell phone ringing, and rig up a contraption to lower the Greek down to look for it. The rope they’re using to lower him snaps (due in no small part to the acidic sap of the vines, which has eaten away some of the rope) and the Greek plummets down the shaft, severely injuring himself. The others manage to get him out, and now must contend with caring for a critically wounded person on top of their already surreal dilemma. To say any more would spoil the book, except to say that the vines turn out to be much more than just acidic. The initial denial the characters feel—how things like this just don’t happen, and their certainty that they will be rescued—is gradually replaced by an overwhelming sense of dread, as they begin to wonder if they will, in fact, die on the vine-covered hill. Scott Smith’s writing style struck me as sort of minimalistic—almost businesslike. There’s no excessive descriptions or long tangents about things that don’t matter. At over 500 pages I was expecting to skim some passages, but it’s actually a lean, no BS story. Between Smith’s style and the fact that there are no chapters to separate parts of the book, I initially thought the book was oddly written, but was quickly consumed by the story. In the two years or so since I started reading regularly again, this is easily the best book I’ve read, and although it is classified as horror, I think people who don’t normally enjoy the genre could still get into this book. At one point about halfway through, I was so caught up in the group’s struggles just to survive that I forgot about the vines altogether. Scott Smith has only written one other novel, his debut, 1993’s A Simple Plan, which Smith himself adapted for the big screen in 1998, directed by Sam Raimi and starring Billy Bob Thornton, Bill Paxton, and Bridget Fonda. I’ve neither read the book or seen the movie, but both are now on my short list of things to read and watch. There you have it, as high a recommendation as I can give to The Ruins—2 Jobes Up, if you will. Give it a shot and see if you don’t allow a little extra room the next time you walk past your spider plant. 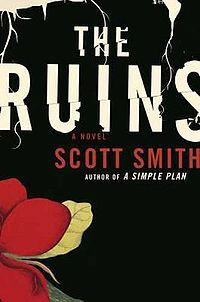 This entry was posted in Books and tagged book review, horror, Scott Smith, The Ruins. Bookmark the permalink. Just the review alone has me freaked out. I don’t watch horror flicks, I’m not sure I could read a book in this genre. I also love my garden. The vine plants I have already scratch at me enough when I tend the garden, I don’t want to think about what else they could do to me!!! Ahhhhhh. Yeah…. That’s what I’m thinking… Maybe a different one you review will ‘ve right for me.